There is a school of thought that ‘The Old Chapel’ was once fairly central, or at least very near to the Medieval Village of Ullenhall. The site of the Chapel situated on the hill was of common practice, as it was clearly visible for miles around; a sort of beacon. Today, it stands alone with a few old cottages for company. The Old Chapel is a late 13th century Chapel that is still in use by the parishioners throughout the summer months and on special occasions. It is full of atmosphere and history and is lit solely by candle-light during evening sessions. Although there was probably a building on this site in pre-Christian times, of the original building, only the chancel is left. In 1875 the Newton family of Barrells Hall built the new Church of St Mary the Virgin on a site nearer to the developing village. The Old Chapel is full of interesting features. The wrought iron altar rails are dated 1735 and were discovered in the woodyard at Barrells Hall and re-laid in their original position in 1919. The 15th century font has an octagonal bowl, the lower edge being moulded, and it rests on a plain shaft. A staple remains in the bowl, a relic of pre-Reformation days when the lid was fastened down to prevent superstitious uses of the christening water which always remained in it. Beneath the Chancel floor is the family vault of the Knights of Barrells Hall. They were first laid to rest at the Former Parochial Church at Wootton Wawen, and afterwards moved to a mausoleum on the Barrells Estate. The mausoleum fell into disrepair and the bodies were taken to the vault under the Chancel. There are memorials to this family on the walls of the Chapel. The seats in the Old Chapel date from the first half of the 18th century. There is a sundial on the south side of the bell-cote. The bell is hung in an open cot on the west gable of the Chapel and it dates from the latter half of the 14th century. The existing bell was restored with the help of the Millennium Restoration Project, to enable it to be rung as part of the nationwide ringing-in of the new millennium in 2000. On the west side of the Chapel-yard is a house converted from cottages – one of the buildings was formally the Parson’s Stable, for use, probably when he rode, or drove, over from the neighbouring Parochial Church at Wootton Wawen. Henley in Arden is a small market town and its name is a reference to the Forest of Arden. The one mile long High Street is one of the best known in England and contains over 150 buildings listed as being of Special Architectural or Historic Interest. It originated as Feldon Street, the main road out of the Forest of Arden. Today, it is a fine example of a medieval ‘street’ village and is designated as a Conservation Area. Notable among the buildings is the half timber-framed Elizabethan Guild Hall, standing to the north of St John the Baptist Church. It has been extensively restored although many of the original timbers remain. The Guild Hall is where the Court Leet, an ancient manorial court, meets every November to elect its officers and to report on the work of the year. The Guild Hall and ‘Jubilee Garden’ can be viewed by application to the Custodian at the Guild Cottage, on the right through the passage to the north of the Guild Hall. The very beautiful garden is entered through the grill gate in the passage. 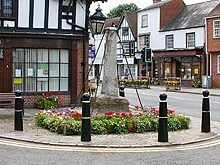 In the centre of the town is the Old Market Place where stands the remains of the 15th century Market Cross, one of the few still existing in Warwickshire. It is composed of local stone but only the raised base of three steps and the shaft are left. The Henley in Arden Heritage Centre at Joseph Hardy House in the High Street is itself a rare architectural gem. The oldest parts of the house have been dated to 1345. An excellent way of seeing Henley in Arden is to start at the Heritage Centre and follow the ‘Town Walk’. Henley in Arden is divided into two parishes, Henley and Beaudesert and each with their own parish Church. The two benefices of Henley in Arden and Beaudesert combined in 1915 under one incumbent and services are now held regularly in both Churches. The original Church on the site of St. John the Baptist was built in 1367. At this time the people of Henley in Arden needed to travel the two miles to the Parochial Church at Wootton Wawen for their worship. The Church in Henley was erected in order that the parishioners would not have to make the difficult and dangerous journey to the mother church at Wootton Wawen. 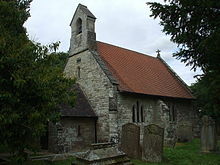 A short distance away from St John’s, lying at the foot of the hill known as the Mount stands the Norman Church of St. Nicholas. Beaudesert. The exact date of the Church is unknown, but it is thought to be about 1170 and was probably built by Thurstan de Montford, Lord of the Manor, who also built the powerful Norman castle on the Mount, no trace of which remains. The churchyard at St. Nicholas is also used as the churchyard for St. John the Baptist. A more in depth history and description of both the town and the Churches is available as a printed pamphlet in St. John’s.